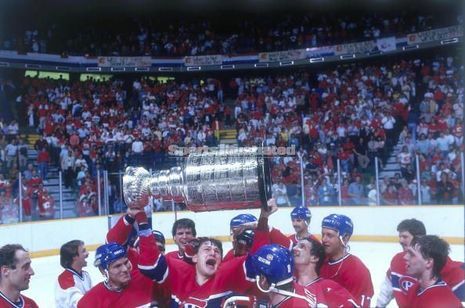 The 1986 Stanley Cup Final NHL championship series was contested by the Calgary Flames in their first Final appearance and the Montreal Canadiens in their 32nd. 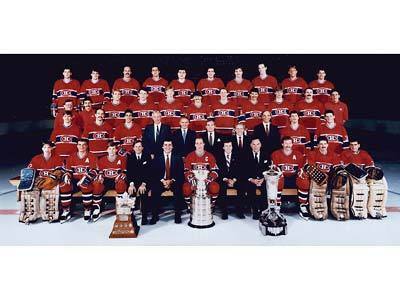 The Canadiens would win the best-of-seven series four games to one, to win their twenty-third Stanley Cup. It was the first all-Canadian finals since 1967, the last year of the original six era. Calgary defeated the Winnipeg Jets 3–0, the defending champion Edmonton Oilers 4–3 and the St. Louis Blues 4–3 to advance to the final. Montreal defeated the Boston Bruins 3–0, the Hartford Whalers 4–3, and the New York Rangers 4–1 to make it to the final. Brian Skrudland's game-winning goal in game two ended the shortest overtime in NHL playoff history, at a mere nine seconds. Montreal rookie goaltender Patrick Roy was awarded the Conn Smythe Trophy as the playoff MVP. In the first all-Canadian final since 1967, the Montreal Canadiens won their 23rd Stanley Cup, an NHL record. 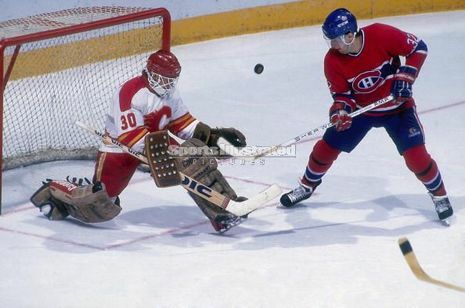 Rookie goaltender Patrick Roy was sensational posting a 1.92 goals-against average in 20 games. He became the youngest winner of the Conn Smythe Trophy at the tender age of 20. Roy's playoff run made a name for himself and reminded fans of former Montreal goaltender Ken Dryden who also won the Cup as a rookie, back in 1971. The Habs' offensive sparkplug was Swedish-winger Mats Naslund, who recorded seven points in the final. 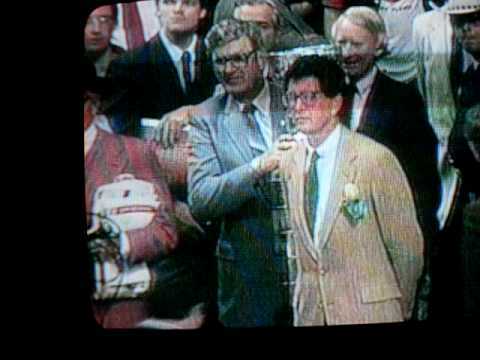 Calgary would revenge this Cup defeat four years later, defeating the Habs in the rematch. In a bid to bind the team’s players together as they begin the playoffs, the Canadiens’ brass decides to sequester them on Montreal’s South Shore. In no time, the hotel where they are kept under “house arrest” is affectionately nicknamed Alcatraz by the players. The move appears to bear fruit right from the start of the playoffs as the Habs face the Boston Bruins in the first round. The Canadiens pick up where they left off during the regular season, which saw them win five of eight games against Boston. They send the Bruins packing in short order with a three-game sweep to reach the division final. 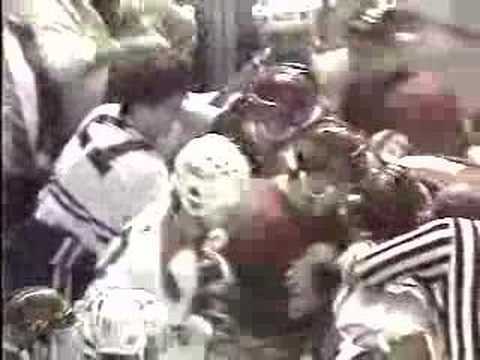 Rookie Claude Lemieux, who joined the team late in the season, scores the winning goal in each of the last two games of the series. Montreal faces the Hartford Whalers and their trio of talented young forwards, Ron Francis, Kevin Dineen and Ray Ferraro. The series shapes up as a defensive struggle. After allowing four goals in the series opener in Hartford, Patrick Roy holds the Whalers to eight goals over the next four games. Meanwhile, Guy Carbonneau leads the way on offense with five goals in the first five games of the series. Neither team takes control of the series, which goes the limit. In one of the Canadiens’ most memorable games of the 1980s, Lemieux scores his third game-winning goal of the playoffs as he beats Mike Liut in overtime, and the team advances to the conference final. In the wake of their tense division final, the Habs quickly take care of business against the New York Rangers with a five-game series win. Once again, rookies Roy (nine goals allowed) and Lemieux (three goals, two assists) are standouts during the series. Roy will later call his performance against the Rangers in Game 3 at Madison Square Garden – a 4-3 overtime win in which he makes 44 saves – the best outing of his career. In the Final, Perron’s team faces the Calgary Flames, who had previously knocked off Wayne Gretzky and the Edmonton Oilers, the prohibitive Stanley Cup favorites, in seven games. It is the first All-Canadian Final in 19 years. The Habs lose the opener 5-2 in Calgary. It’s the only loss the Canadiens will incur during the series. Brian Skrudland draws Montreal even in the series as he scores nine seconds into the extra frame in Game 2, the fastest goal from the start of overtime in NHL history. With the series shifted to the Forum, the Canadiens gain the upper hand in the Final with a 5-3 win. Prior to Game 4, the team’s star rookies challenge each other: Roy will hand over his ubiquitous Walkman to Lemieux if he scores the winning goal. The sparkplug forward is up to the wager and delivers the game’s only goal, and the young goalie keeps up his end of the bargain and posts his first career playoff shutout. Back at the Saddledome, the Habs win the fifth game and claim the 23rd Stanley Cup in team history. This title allows the Canadiens to move past the New York Yankees for the most championships won by any North American professional sports team.